It's fairly common when creating a shop to have products that are available in different colours, sizes, styles, guarantee options and to have other slight differences with the same product. To sell these products you can either create a separate page for each product, or use a product variant to preset styles/colours etc. Selling a t-shirt is one thing, but getting the right size garment is crucial to your customer. This is not as complicated as you might first think and you can have a successful product variant running in a matter of minutes. The easiest way to set up your variant groups is by clicking Catalog/ Product Variants. Figure: Setup your Product Variants by choosing "Catalog > Product Variants" in the Administration Panel. A pop up window listing any variants available will appear. Figure: Open the "Manage Product Variants" window to add new variant groups and edit or delete existing ones. The window has links for creating a new variant group and editing or deleting any existing ones. Note: If you delete a variant group that affects product stock (such as 'Color' or 'Size'), the stock of all the products using this group will be set to 0 and any current stock settings for these products will be lost. Firstly you need to click the "Add New" button and type in a name for this new variant group. Put in something that is very clear about what you're trying to offer and easy for you to remember its definition. Simple names are easy for you to remember later on when adding them to your pages, so "Guarantee", "Colour" and even "Style" should be important factors. So for example here we will use "Guarantee".
! If your store is in more than one language, you will define a separate name for each language. You also need to define whether the variant group affects the product stock or not. For example 'Size' might affect product stock but 'Guarantee' wouldn't. Tick the box only if this group affects your product stock.
! Once this is defined here it can not change later on so be sure to get this setting right! Figure: Creating the new variant group "Guarantee". Figure: A new variant group named "Guarantee" has just been created.
! You are not creating a variant group for one product, you can use it in any of the products you need to apply it in. It's a multipurpose selection. Now that we have created the group name we need to add the available guarantee periods to the group. Clicking "Edit" will let you add more options within the group. You would normally start with the shortest period, so you can offer it in a simple format like 1yr/2yrs/3yrs+ or by typing 1 year/2 years/3 years or more. There is plenty of space for typing so keep it as clearly defined as possible. You simply enter one at a time and click the "Add" button to make it active within the list. Once you have added all your options, check to see that you have clicked the "Add" button for the last option you added and then click the "Save and Close" button to finalise your details. Figure: Adding Variants to the "Guarantee" group. Now that completes one part of the needed information, and your option appears on the list. You can carry on adding more options if you need to, or come back at any time to create more product variant options as the need arises. The possibilities are endless, and it comes down to what products you sell, and how you want to market them. Having the Product Variants created is now done and we need to make them visible in the Catalog. After you have created an item in the Catalog that requires a variant, simply click the "Pricing" Tab. Below the price is the variants section, now all the variants you have created are in the drop down box on the left, click it and select the option you require. In our case we opted for "Guarantee". You will notice that you can select one or all of the differences within a variant, either a certain period or all together. That way if some items are only available with a specific guarantee option, you can still offer it with the certain guarantee and it makes it perfectly clear to the customer there is only one guarantee option available. Alternatively, if all variants are available you can just choose "All" in the "Description" field to insert them all in one go. But keep in mind that unless you choose "All", you will have to define here all the variants available, one after the other, or these won't be visible on your storefront page! Figure: Defining Variants for a product. Moving along from there we have a price change option. Products can vary in price according to the guarantee period offered; a "3 year or more" guarantee for example can be more pricey than a "1 year" guarantee, so you can add the extra cost by typing it in the box. You have two options for the price also, a percentage of the cost of a normal product, or a simpler fixed price. This way as the guarantee period increases you could add a 10% surcharge on the normal price, or simply a "3 years or more" guarantee option can be offered with a fixed surcharge. Differences between the variants offered can be displayed by adding a thumbnail. That's a very important selling point. You could display the exact product each variant refers to so people can clearly see any differences. Your customers will be more likely to purchase if they can see the product they are buying and differences with other similar items. When you're all done, click the "Add New" button, and if you need to, add another product variant to the same Catalog entry. There is no limit to the number of variants you can have, you can add one for guarantee and one for color. But you don't want to add too many as this could make ordering complicated. Simpler is better and faster for the customer. Once all the variants of a camera product have been added, the complete variant form will look as follows. Note that you can change the order in which the variants will appear on your storefront by using the buttons under the "Order" list. Click on the "Remove" button under the "Actions" list to remove any Variants you don't want to keep. Figure: Defining Variants for a camera available in 3 Colors (silver, blue and red) that comes with 3 Guarantee options.
! Variant groups can affect or not affect the product stock (e.g. 'Color' and 'Size' might affect stock but 'Guarantee' wouldn't). If you introduce or delete variants that affect stock, the current stock status of your product will change. This happens because the stock status differs for every variant combination and some (or all) variant combinations will be reproduced. The stock of the new combinations will be set to either 9999 (when you introduce) or 0 (when you delete). Figure: Storefront product page of the camera, after assigning all variants. Filter Groups are general categories giving crucial information about a product (e.g. Manufacturer, Price etc.). Customers are more likely to start looking for the desired product using these as the initial criteria for their search. Variant Groups are used to further define a product (e.g. Color, Style, Size, Guarantee etc.). You will use these to effectively show the variation of your product range, to add extra charge for certain product variants (e.g. large sizes or long guarantee periods) etc. Figure: Filters and Variants related to a TV product range. Click the "Add new" button to create a group. Once your group is created click "Edit" to list each difference in turn and click "Add" after each item. When all your items are complete, click the "Save and Close" button. To use variants on products got to the product "Pricing" tab and use the drop down list to select which variant you want to add. Make sure to double check any additional costs. Use the easiest option to achieve this, a set price addition or a percentage. You can add as many product variants as you need, but try to keep it to a maximum of two, for example colour and guarantee. 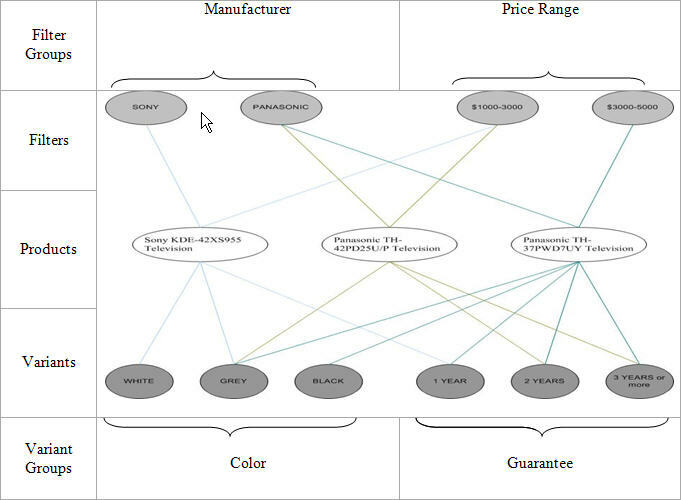 Keep in mind that you will use Filter Groups to help your customers find the product desired but Variant Groups to show the variation of your product range.